Thsi story is too funny I could not resist. Alien wanna be Tom Cruise and his cult Scientology being sued. In court papers provided to The News by investigator Paul Barresi, Letterese claims a member of the church phoned his lawyer at home, and when the lawyer’s wife answered, said he was her husband’s homosexual lover. Barresi, who has done investigative work on behalf of Cruise, tells us: "[Letterese] is just including a celebrity name to get attention." Letterese calls the church a "crime syndicate" and wants it broken up under the Racketeer Influenced and Corrupt Organization law, just as the feds have broken up Mafia families. 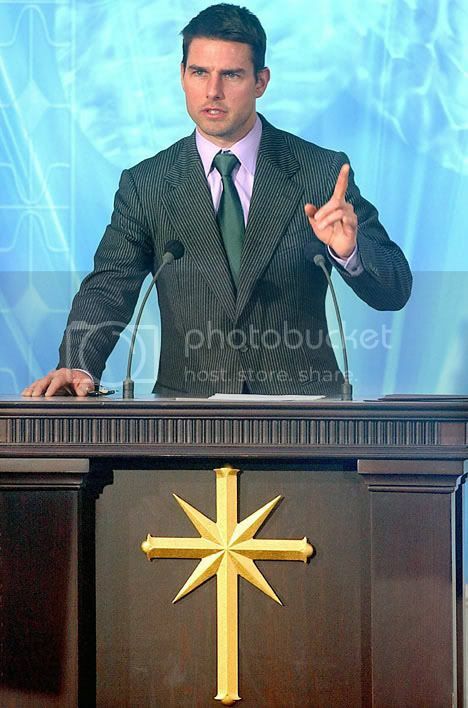 He singles out Cruise, who’s made no secret of his religion, saying that Scientology head David Miscavage is "aided and abetted by the actions of Tom Cruise, his right-hand man for foreign and domestic promotion, as well as for foreign and domestic lobbying. He has assisted the syndicate in acquiring funds and [made] his own donations of money believed to be in the multiple tens of millions of dollars." Tom "Alien" BANNED because he is a Scientologist!